Exceptional location for this holiday rental - max 10 people. At the exit of St Remy de Provence, at the foot of the Alpilles, inthe hamlet La Galine, this beautiful farmhouse of character has been completely renovated. Air-conditioned and with 450 m² of leaving area, it includes a large kitchen / dining room, 2 living rooms with a fireplace, and a bedroom in suite on ground floor. Upstairs, 4 double bedrooms with bathroom or shower room and toilets. 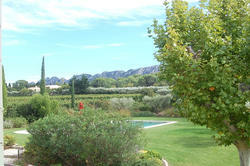 Located on a vineyard of 2.5 ha with trees and flowers, you will appreciate the calm and the superb view of the Alpilles !